The production of the East Africa Highland banana, also known as cooking banana and “matoke” in the region is poised to get a boost with the distribution of the first-ever, high-yielding, and disease-resistant hybrid varieties. With nearly 60% higher yield than the local “matoke”, these hybrids are also resistant to black Sigatoka, an important fungal disease of the crop worldwide that affects the leaves and leads to losses of 30­-80%. According to Rony Swennen (IITA banana breeder), these hybrid bananas spell good news for millions of smallholder farmers growing the crop and has great potential in efforts to boost the region’s food security and poverty reduction efforts. “Most of the cooking bananas grown by smallholder farmers are old varieties that are low yielding and very susceptible to diseases. With these new hybrids, we expect the production to increase significantly and have a positive impact on food security and income in the region,” he says. “East Africa Highland banana is an important food and income crop in Uganda, the number one producer of banana in the world. We are very excited to take a lead and support efforts for developing these hybrid varieties which will not only make a difference for smallholder farmers in Uganda but also in the region,” said Dr Wilberforce Tushemereirwe who leads the banana program of NARO. IITA initiated the banana program in collaboration with NARO, Uganda, in the 1990s with a joint breeding program at Kawanda and Sendusu, using some of IITA’s hybrids from Nigeria. This program led to the development of these 26 EAHB-hybrids with pest/pathogen resistance. Overall, IITA started its banana and plantain program in Nigeria in 1979 to address challenges facing plantain in that region—low yield and attack by the fungal disease Black Sigatoka. 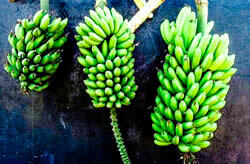 This resulted in a breakthrough with the development of the technology to obtain seeds from the sterile banana crop, seed germination, and selection of Black Sigatoka resistant plantain hybrids with yield increases of up to 225%. NARO is a body corporate with perpetual succession and a common seal. NARO comprises of the council as its governing body, committees of the council as its specialised organs, a secretariat for its day-to-day operations with the semi autonomous public agricultural research institutes under its policy guidance.